November media attention to climate change and global warming was down 8% throughout the world from October 2018, and up about 33% from November last year. Radio coverage held steady from October 2018 but was up 27% from November 2017. Across all sources, regionally an increase was detected in Europe (up 11%). Elsewhere, moderate decreases from October to November 2018 were found in North America (down 8%), Asia (down 14%) and Central/South America (down 17%), while more substantial downturns in the quantity of coverage were found in the Middle East (down 21%), Oceania (down 34%) and Africa (down 39%). In January of this year, MeCCO expanded coverage to sixty-two newspaper sources, six radio sources and six television sources. These span across thirty-eight countries, in English, Spanish, German and Portuguese. In addition to English-language searches of “climate change” or “global warming”, we search Spanish-language sources through the terms "cambio climático" or "calentamiento global", German-language sources through the terms ‘klimawandel’ or ‘globale erwärmung’, and Portuguese-language sources through the terms "mudanças climáticas" or "aquecimento global". Figure 1 shows these ebbs and flows in newspaper media coverage at the global scale – organized into seven geographical regions around the world – over the past 179 months (from January 2004 through November 2018). Figure 1. Newspaper media coverage of climate change or global warming in sixty-two sources across thirty-five countries in seven different regions around the world, from January 2004 through November 2018. At the country level, counts held steady or decreased from October to November 2018, except for in Spain where coverage was up 22%. In the United States, print coverage was down 5% in November compared to October, though still up considerably from the previous November 2017. However, US television coverage of climate change spiked in November 2018, as it was up 71% from October 2018 and also up considerably from coverage a year ago (November 2017). Moving to considerations of content within these searches, Figure 2 shows word frequency data in the US television media coverage in November 2018. While US TV coverage was up to its highest levels since December 2016, television media attention appeared to be driven by stories relating to President Trump rather than other stories like the US National Climate Assessment (NCA4) released on November 23 (see below for more). 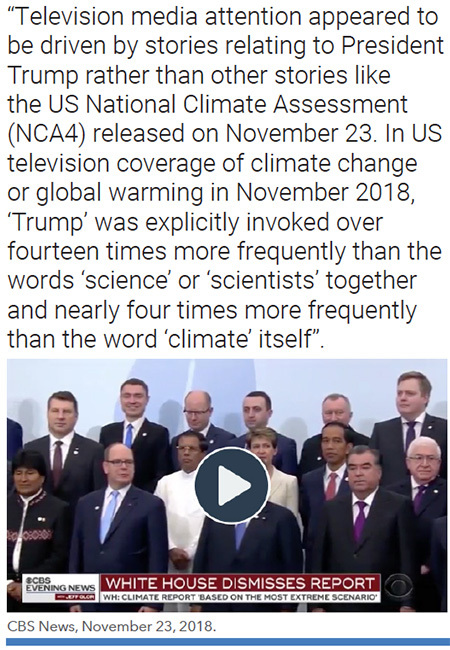 In US television coverage of climate change or global warming in November 2018, ‘Trump’ was explicitly invoked over fourteen times more frequently than the words ‘science’ or ‘scientists’ together and nearly four times more frequently than the word ‘climate’ itself, for examples. In November, considerable attention was paid to scientific dimensions of climate change and global warming. For example, a new study published in Nature found that global oceans have been absorbing more heat than previously understood. This buffer to atmospheric warming was then noted, as oceans have warmed more than the IPCC previously estimated over the past twenty-five years. Journalist Matt McGrath from the BBC reported “ this new study says that every year, for the past 25 years, we have put about 150 times the amount of energy used to generate electricity globally into the seas - 60% more than previous estimates”. Figure 2. 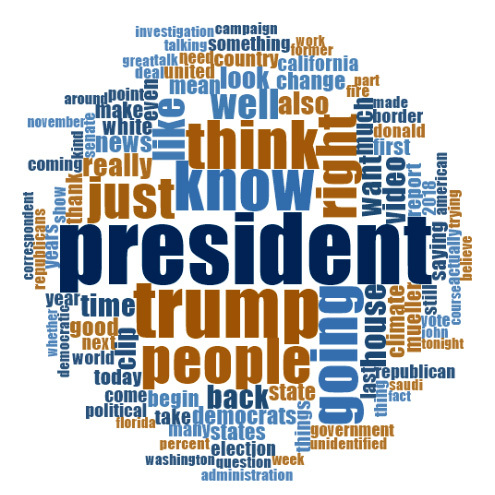 Word cloud showing frequency of words (4 letters or more) invoked in media coverage of climate change or global warming in United States television sources. A second example arose in early November through media coverage of the simultaneous release of two studies in Nature examining interactions between human activities and hurricane impacts. While one study noted increased rainfall by hurricanes Katrina, Maria and Irma through anthropogenic climate change, the second study predicted that future hurricanes will increase in intensity due to human contributions to climate change. Journalist Seth Borenstein from the Associated Press wrote, “Hurricane Harvey snagged on the skyscrapers of Houston, causing it to slow and dump more rain than it normally would, one study found. The city’s massive amounts of paving had an even bigger impact by reducing drainage. Land development in the metro area, on average, increased the chances of extreme flooding by 21 times, study authors said. A second study looked at last year’s major Hurricanes Maria and Irma and 2005′s deadly Katrina and used computer simulations to see what would have happened if there had been no human-caused global warming. The study found that climate change significantly increased rainfall from those three storms, but did not boost their wind speed.” Meanwhile, journalist Rebecca Hersher from National Public Radio reported, “A pair of studies published today in the journal Nature find that hurricanes are already causing more rain than they used to, and that cities themselves may be making the rainfall from those storms even worse”. As a third example, in mid-November a new study published in Nature Climate Change found “traceable evidence for 467 pathways by which human health, water, food, economy, infrastructure and security have been recently impacted by climate hazards such as warming, heatwaves, precipitation, drought, floods, fires, storms, sea-level rise and changes in natural land cover and ocean chemistry”. Journalist Maggie Fox from NBC News reported that lead author Camilo Mora and team “combed through more than 3,200 studies to try to paint a broad picture of what climate change is going to do to people over the coming century. They cross-referenced their findings against known disasters”. USA Today journalist Doyle Rice wrote, “Don't say we weren't warned. From human health to the world's food supply, from water scarcity to widespread migration and violence, the threats from climate change are much larger than previously thought, a study released Monday suggests. And in many places, several threats will be happening at once”. As a fourth example, a new University of Chicago report released in mid-November articulated that particulate pollution from fossil fuel burning effectively has shortened life spans by over four years for an average Indian and nearly three years for a typical denizen in China. Washington Post journalists Bonnie Berkowitz, John Muyskens, Manas Sharma and Monica Ulmanu reported that lead author Michael Greenstone credited the 1970 US Clean Air Act for many avoided deaths from air pollution in the United States, and noted that it was why “wildfires in California triggered air quality alerts and forced school closings many miles away”. Also piling onto a busy month for coverage of scientific dimensions of climate change, in the final days of the month media attention was paid to the UN Environment Emissions Gap Report and a Lancet Countdown on climate change and public health. The findings of the UN Environment Emissions Gap Report stated that mitigation efforts must increase dramatically in order to avoid the worst impacts of climate change. For example, Elaine Kurtenbach from The Associated Press wrote “Feeding a hungry planet is growing increasingly difficult as climate change and depletion of land and other resources undermine food systems, the U.N. Food and Agricultural Organization said Wednesday as it renewed appeals for better policies and technologies to reach ‘zero hunger’. Population growth requires supplies of more nutritious food at affordable prices, but increasing farm output is hard given the “fragility of the natural resource base” since humans have outstripped Earth’s carrying capacity in terms of land, water and climate change, the report said”. CNN reporter Brandon Miller noted, “If there is one consistent message about climate change that has been made abundantly clear in a flurry of recent major assessments on the topic, it is that our planet's climate is already changing, and now is the time to act to avoid devastating impacts”. Coverage of the Lancet Countdown report on climate change and public health was detected across the globe. 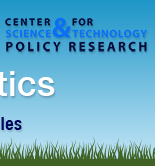 (Among the 150 report co-authors were MeCCO team members Olivia Pearman, Lucy McAllister, Meaghan Daly and Max Boykoff). For instance, journalist Damian Carrington from The Guardian reported, “People’s health is being damaged today by climate change through effects ranging from deadly heatwaves in Europe to rising dengue fever in the tropics, according to [the] report. Billions of hours of farm work has [sic] been lost during high temperatures and global warming has damaged the ability to grow crops. The world must triple its efforts to curb emissions over the next few years to avoid the worst impacts of climate change”. Moving to media accounts focused on primarily political and economic content, some selected issues generated attention in November. For example, a new World Energy Outlook report released by the International Energy Agency documented that renewable energy sources will provide about 40% of electricity on planet Earth by 2040 and that petroleum demand for automobiles will begin to decrease after 2020 due to regulatory interventions along with electric vehicle technology breakthroughs. However, the report noted that energy infrastructure investments and policy action in the next years will be critical to determining how climate change unfolds in the next decades. Focusing on that latter caution, journalist Adam Vaughan from The Guardian reported, “the world has so many existing fossil fuel projects that it cannot afford to build any more polluting infrastructure without busting international climate change goals, the global energy watchdog has warned”. Meanwhile, Reuters journalist Nina Chestney noted, “Natural gas is expected to overtake coal as the world's second largest energy source after oil by 2030 due to a drive to cut air pollution and the rise in liquefied natural gas (LNG) use”. In this political realm relating to the NCA4 report mentioned above, a number of stories paid attention to the US Federal Administration’s reactions to findings and recommendations. For example, Washington Post reporters Josh Dawsey, Philip Rucker, Brady Dennis and Chris Mooney covered US President Trump’s reaction. They wrote, “President Trump on Tuesday dismissed a landmark report compiled by 13 federal agencies detailing how damage from global warming is intensifying throughout the country, saying he is not among the ‘believers’ who see climate change as a pressing problem. The comments marked the president’s most extensive yet on why he disagrees with his own government’s analysis, which found that climate change poses a severe threat to the health of Americans, as well as to the country’s infrastructure, economy and natural resources. The findings – unequivocal, urgent and alarming – are at odds with the Trump administration’s rollback of environmental regulations and absence of any climate action policy. “One of the problems that a lot of people like myself, we have very high levels of intelligence but we’re not necessarily such believers,” Trump said during a freewheeling 20-minute Oval Office interview with The Washington Post in which he was asked why he was skeptical of the dire National Climate Assessment his administration released Friday. “As to whether or not it’s man-made and whether or not the effects that you’re talking about are there, I don’t see it,” he added”. November media coverage also covered ecological and meteorological themes. Most prominently, stories discussed connections between (California) wildfires and climate change. The Camp Fire in Northern California led to dozens of deaths and many hundreds missing, while also warranting a visit from the US President. Meanwhile, the Woolsey Fire in Southern California has led to a handful of deaths but widespread evacuations and property as well as air quality damages. Journalist Tim Stelloh from NBC News reported “The fires occurred after years of drought and increasingly deadly and destructive fire seasons. Fire officials and climate scientists have, in part, attributed those fires to climate change, saying the state’s fire season may now be year-round. California Gov. Jerry Brown stressed this during a news conference on Sunday night, calling this extended period of fire danger a ‘new abnormal’”. CNN journalists Dakin Andone, Nicole Chavez, and Emanuella Grinberg noted how winds and climate change were ‘provoking’ the fires. Across the globe in October, there were also stories that intersected with the cultural arena. For example, The Associated Press reported in mid-November that London protesters representing a group called ‘Extinction Rebellion’ “blocked off the capital's main bridges to demand the government take climate change seriously…about two dozen people were arrested after protesters blocked traffic and glued themselves to gates outside the Department for Business, Energy and Industrial Strategy”. Later in the month, thousands of Australian youth across twenty cities skipped out of school in protest of the Australian government’s inaction on climate change. Reporting by Frances Mao from the BBC noted, “The idea started with Milou Albrect and Harriet O'Shea Carre, both 14, in the state of Victoria. “The climate change emergency is something we have been thinking about for a long time,” Harriet said. “We wrote letters and did different things but they never seemed to make a difference. Really, education, is our only power. By sacrificing that [on Friday], it's making a big point”. Heading into the new year, we at the Media and Climate Change Observatory will continue to monitor and analyze media coverage of climate change. 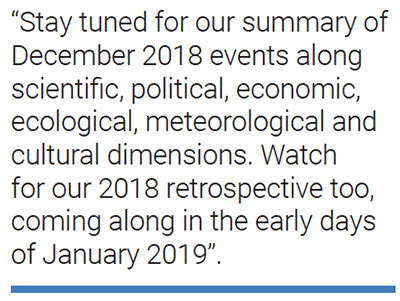 Stay tuned for our summary of December 2018 events along scientific, political, economic, ecological, meteorological and cultural dimensions. Watch for our 2018 retrospective too, coming along in the early days of January 2019.